I've struggled with dry skin since I was a kid, but it got much worse when I was diagnosed with Crohn's disease at sixteen. The skin on both my face and body are dry, but I find the dryness on my body harder to deal with especially in the winter. During my favorite season the skin on my body gets super flaky, can be nearly impossible to keep moisturized, and is almost always itchy. As you can imagine having crazy dry skin is not the most comfortable situation, but this year I've been adding some new products into my routine combined with a few products I've been using for years and have been having a much better time with my skin issues! I know that I'm far from the only person who suffers from dry skin, especially this time of year so I wanted to share with all of you what's been working for me. Below are the products I'm loving and the details of how I'm keeping my skin moisturized and feeling comfortable! Exfoliating is important to remove the dead and flaky skin that accumulates on your body. If you do not remove the dead and flaky skin the moisturizers you apply cannot penetrate it and do not get deep enough to fully hydrate your skin. You can use both chemical and/or physical exfoliants to help you with this (check out this post to learn the difference between the two) and I prefer using a mix of the two. Bath & Body Works Foaming Sugar Scrub- This is one of my favorite scrubs as it does a great job exfoliating, but isn't too harsh. It also contain oils that are left behind on your skin to moisturize it. I usually pick up several of these whenever they're on sale so I almost never run out of them. Tree Hut Shea Sugar Scrub- This is a grittier scrub that I like to use when my skin is super flaky as it really deeply exfoliates. It also begins moisturizing your skin when you use it with shea nut oils and contains vitamin C to help keep your skin healthy. DERMAdoctor KP duty Body Scrub- This scrub is a combination chemical and physical exfoliant. It combines the benefits of a chemical peel and microdermabrasion in one. This is particularly great if you suffer from keratosis pilaris (chicken skin). Using moisturizer to hydrate your skin is the most obvious way to deal with dry skin. I've learned though that not all moisturizers are created equally so when you're struggling with very dry skin it definitely matters which creams, lotions, and oils you choose to use. Eucerin Intensive Repair Enriched Lotion- This cream combines moisturizer naturally found in the skin with alpha hydroxy acids to intensely hydrate, exfoliate, and smooth skin. This cream is thick, rich, and deeply moisturizes. With its combination of moisturizers and exfoliants I would say that this product has been the most important one I've added to my routine to help with my dry flaky skin. Curel Ultra Healing Lotion (c/o)- This lotion is very moisturizing, but with a lighter feel. It works to better maintain skin's barrier so it can better lock in and maintain moisture. If you're looking for something strong that absorbs quickly this is that. Kiss My Face Body Lotion (c/o)- This lotion uses natural oils and antioxidants to smooth and hydrate skin. It has a thick feeling to it, but doesn't take as long to absorb as you would think it would upon initial application. It's also great for anyone who has any issues with parabens and phthalates as it does not contain them. Lush Dream Cream- This is my go to for dry and itchy skin. It works to hydrate your skin, while also soothing it, which is so important when you have skin like mine. It contains oat milk, lavender, and chamomile to soothe, and olive oil and shea butter to help with dryness. Jojoba Oil + Coconut Oil- I love using both of these oils (separately) from time to time as a way to naturally intensely moisturize my skin. I will also sometimes add them to one of the other moisturizers mentioned above to give it a little added hydration power. The great thing about these is that they're multipurpose and can also help with dry skin on your face, hands, and feet too! -Exfoliate at the end of your shower so that any oils or moisturizers in your body scrub will stay on your skin. -Always apply a lotion, cream, or oil to your body after showering to replace the moisture that your skin lost. -After showering pat skin dry with a towel (being gentle is important) and immediately apply moisturizer. -To lock in extra hydration apply moisturizer to damp skin after showering. -For severely dry skin apply moisturizer twice a day, a lighter lotion like this in the morning and a more intensive one like this at night. -Add any oil (almond, jojoba, coconut, baby oil, etc.) to your lotion or cream to make it extra powerful. -Allow moisturizer to sink in for a few minutes before putting on clothes. If you have any questions about any of this please feel free to ask in the comments or email me. What are your favorite products or best tips for dry winter skin? Today I'm linking up with #HowIFall, Hello Monday, and Weekending. My skin gets so dry and itchy in the winter. I cannot live without my Curel lotions! My skin is horrible in the winter, but I have been using Coconut Oil lately and it has been making it so much more hydrated! I will have to try Jojoba Oil as well! I want to try out Dream Cream! I love Lush's Sleep lotion, so I'm sure that one is just as good! I hated this the mosttt when I lived in the US and had winter! My skin would get so dry and uncomfortable! These all look like amazing products! Winter skin is so tricky! I love that Lush cream too girl! Great tips! I'd also like to recommend the Hydrating Lotion by First Aid Beauty - I have eczema and that lotion has been a life saver! I def need to try that LUSH option! I can totally understand what you're going through girl, I have ultra dry, flaky skin but I have found that oils are very helpful. UGH YES KRISTIN. 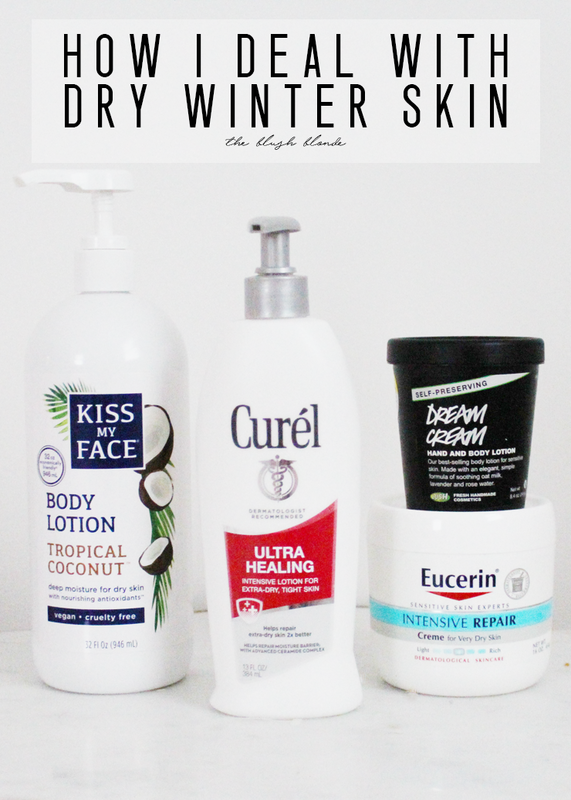 I have the worst dry skin normally and it gets even worse in the winter! I've never used any of these but now I'll have to try them out!! I def need to get better about exfoliating...it's the one thing I always forget to do. My poor skin in the winter. I've been using a salve every day after I shower, and it's helped so much. I would love to st that product from Lush!